Mapping Movies deploys GIS mapping as an iterative process of research and learning rather than as an engine for producing finished maps. Because GIS is “good to think with” (Klenotic, 2011, p. 60), its mappings can represent an active form of spatial reasoning about historical questions and processes. This page contains a portfolio of mappings, both static and animated, drawn from the project’s database. Click the image to see it in detail. Use the ‘back arrow’ button to return to the blog. Women Exhibitors 1901-18 with Gender Distribution by State 1910. Click Map to View Larger Image. Women Exhibitors 1901-18 with Gender Distribution by County 1910. Click HERE to Go Interactive! In a recent essay, “Space, Place and the Female Film Exhibitor: The Transformation of Cinema in Small Town New Hampshire,” I studied the case of film exhibitor May Burnham Richardson, who owned and operated the Star Theatre in Milford, NH from 1912 to 1920. Richardson was a suffragist and one of roughly two dozen women who ran moving picture shows in the state during the 1910s and ’20s. Though it remains unclear at this point how many of New Hampshire’s women exhibitors were suffragists, recent research by scholars such as Kathryn Fuller-Seeley and Karen Ward Mahar, Paul S. Moore and Louis Pelletier, and Germain Lacasse for the Women Film Pioneers Project has begun to explore the broader terrain of women’s film exhibition more fully, and this work has begun turning up increasing numbers of highly independent business women who owned and/or operated moving picture shows during the silent era. 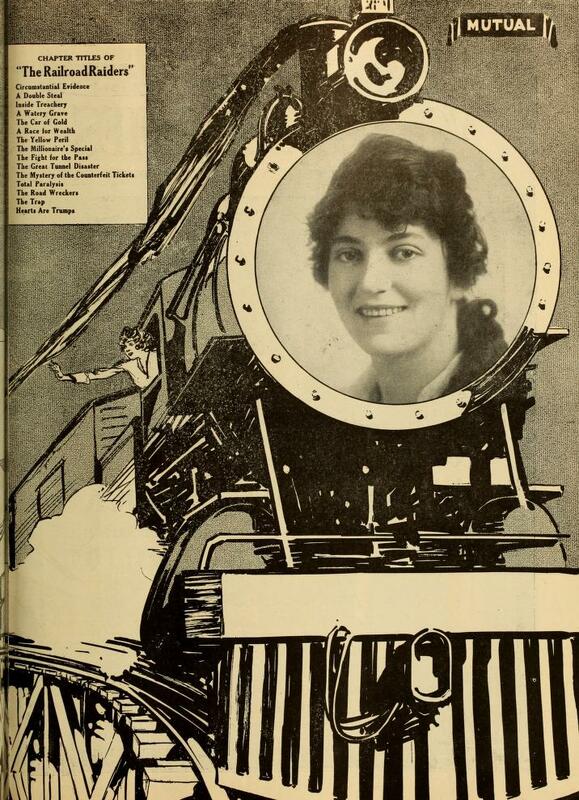 In a forthcoming essay, “Roll the Credits: Gender, Geography and the People’s History of Cinema,” to be published in the Routledge Companion to New Cinema History (in press), I continue to explore the gendered landscape of film exhibition during the 1910s and 1920s, with a focus on how the personal micro-politics of gender relations within exhibitor trade associations during the late 1910s converged, confronted and were co-opted by macro-level changes taking place in the film industry (specifically the rise of vertical integration). As a larger context for my research, I was curious to know how the geographic distribution of women exhibitors during this era may have compared to the distribution of total population by gender across the United States. Were women exhibitors more likely to appear in those parts of the country where women dominated an area’s total population? To answer this question quantitatively would require comprehensive spatial data sets that were precisely aligned temporally as well as the use of formal spatial statistical analysis to determine the significance of spatial correlations between the two geographic distributions at any given moment in time. 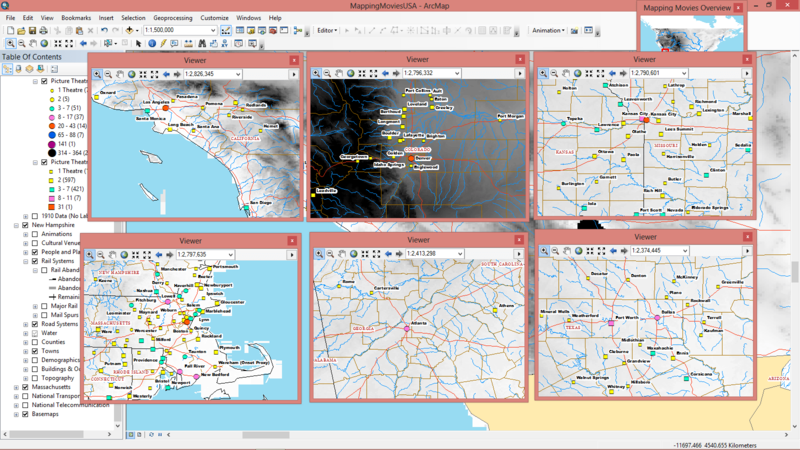 Within a more qualitative mode of research, however, a GIS visualization that combines the two layers of geographic data can serve as a useful heuristic for beginning to think through the complexities of gender and geography as they may relate to the flow of culture and politics through networks of movie exhibition and distribution. Such a visualization may ultimately be more effective in raising new questions for further analysis – through the application of statistics and/or the development of detailed historical narratives – than producing definitive answers in and of itself. The maps displayed at the top of this post visualize two layers of data relating to gender and geography. First, the point data (representing locations where women worked as film exhibitors) is derived from an unpublished database compiled by Max Alvarez (“1901-1918 Women Exhibitors and Distributors”). The database is not comprehensive but it may well represent the most rigorous attempt yet to chart the full extent of women’s work as distributors and exhibitors, as it lists references to women working in these two areas of the industry as found in the following major film trade publications: The Billboard, Motography, Motion Picture News, Moving Picture World, The Nickelodeon, The Film Index/Views & Film Index, and Variety. The maps presented here include only data for film exhibition and do not include data about women in film distribution. Second, the polygon area data (represented in the first map at the state/territory level and in the second map at the county level) is derived from data collected for the 1910 US Census and packaged for public use by the Minnesota Population Center (National Historical Geographic Information System: Version 2.0. Minneapolis, MN: University of Minnesota 2011). As collected by the census, this data counted the number of men and women who were living in a given area of census geography. I then used this data to create a new numerical field that represented the gendered distribution of population by calculating, on a state/territory or county level, the extent to which men or women outnumbered each other in terms of total population for that area. At the state/territory level, there were six of fifty geographic areas where women outnumbered men: 1) Massachusetts = 55,920 more women, 2) District of Columbia = 14,969 more women, 3) South Carolina = 11,716 more women, 4) North Carolina = 9,335 more women, 5) Maryland = 6,896 more women, and 6) Rhode Island = 1,982 more women. At the county level, there were 377 of 2,963 geographic areas where women outnumbered men. Of these, seven had women outnumbering men by more than 10,000 persons: 1) Philadelphia County (PA) = 28,082 more women, 2) Middlesex County (MA) = 26,967 more women, 3) Baltimore City County (MD) = 22,095 more women, 4) District of Columbia (DC) = 14,969 more women, 5) Kings County (NY) = 14,769 more women, 6) Orleans County (LA) = 12,597 more women, and 7) Suffolk County (MA) = 10,866 more women. As previously mentioned, the two geographic data sets are not temporally synchronized. One includes data spanning seventeen years from 1901-18, while the other includes data collected for a decennial census conducted for 1910. Moreover, without spatial statistical analysis, the significance of any presumed visual correlation between the data sets cannot even be speculated upon. Nonetheless, I would suggest that what the maps lack in their ability to precisely answer research questions and close down multiple interpretations of the data, is quite productively offset by their capacity to generate research questions and open up multiple interpretations of the data. What, for instance, might explain the absence of women exhibitors in North Carolina, South Carolina, and Rhode Island, where women outnumbered men in terms of total state population? Did women exhibitors not exist, and if not, why not? Or maybe women exhibitors existed, but traces of their work were not captured in the trade press, owing perhaps to geographic unevenness in the activities of exhibitor trade associations? Would local newspapers turn up different results? Could the county level maps showing areas where women outnumbered men in each state open up starting points for future investigations? Or not? More broadly, how might the moviegoing experiences of counties and regions have varied, based on the distribution of population by gender? What questions might such geodata generate to lead us in the direction of fine-grained historical accounts of moviegoing experiences in, say, Central Pennsylvania, where women outnumbered men, as opposed to Western Pennsylvania, where men mostly outnumbered women? What was it like to be a woman exhibitor in each of these regions? And what might all of this have meant for the cultural and political geography of the women’s suffrage movement, as it made its march toward ratification in 1920? A thoughtful map has the power to prompt us to search for answers to many historical and geographic questions; it can help us see who did what, where, and when, and it can aid us in the development of explanations about how and why events unfolded as they did. Just as importantly, maps can also inspire us to raise questions about who didn’t appear and what didn’t happen, where, and when; this, too, is part of the story. Mapping Movies takes a ‘bottom up’ approach to history. The project puts moviegoers encountering cinema in the places and spaces of everyday life at center stage. For the first half of the 20th century, movie theaters were landmarks of local geography that reflected the status and identity of urban neighborhoods and the civic-mindedness of small towns. These landmarks helped organize the mental maps and flow of people through space. Charting the people’s history of cinema, however, is a slow and complex undertaking. The micro detail required for such a history is vast and, given the ephemeral nature of moviegoing, unlikely to have been documented and preserved in traditional archives. Oral histories and ethnographic research are often required to gain access to moviegoing practices and memories of cinema on a case-by-case basis. The methodological challenges multiply exponentially as researchers grapple with the tens of thousands of locally embedded venues where movies have played across the full span of the medium’s history. As part of the historical research process, GIS mapping offers considerable potential for representing diverse experiences of cinema on a variety of scales by integrating quantitative and qualitative data. In Putting Cinema History on the Map, I refer to this as “little g” as opposed to “Big G” GIS, an approach that balances the omniscient perspective of “big data” against smaller projects built from a bricolage of partial, multiple and competing perspectives formed through a mixed methods framework that Knigge and Cope call grounded visualization. To the extent that such an approach is open-ended, integrating the contributions of a variety of collaborators and end users, it also becomes a form of “vernacular mapping” that forces cartographers and historians to share the authority to produce knowledge with the public (see Gerlach and Bowles). The visualization above is from Springfield, MA where polygons created using H. P. Douglass’s ‘social quality’ data (ethnic and racial census tables, rates of juvenile delinquency, amounts of charity received per household, etc.) have been overlaid with points (locations) and lines (paths) gleaned from oral histories. Oral histories are also embedded as audio files linked to the map. Detailed case studies of moviegoing and everyday life in Springfield’s North End and Hill districts are found in Four Hours of Hootin and Hollerin and Like Nickels in a Slot. This visualization represents a ‘social quality’ index for Springfield, MA based on data collected by the social and religious geographer Harlan Paul Douglass in 1926. Similar to the redlining maps produced by Home Owners’ Loan Corporation during the Depression, Douglass visualized contemporaneous perceptions of ‘desirable and undesirable’ parts of the city based on factors such as industrialization, housing congestion, ethnicity, race, child labor, poverty, and juvenile delinquency (click here to explore the interactive version of Douglass’s maps). Originally a context for understanding the location of churches and their movement from the central city to surrounding suburbs, Douglass’s maps shed light on the cultural geography of moviegoing when combined with theater location data from that era. Among other insights, the maps chart a spatial overlap between the emergence and development of movies and those parts of the city that were heavily industrialized and populated by first generation immigrants and, to a lesser extent, African-Americans. With the exception of two short-lived theaters that sprung up along the border separating the top-rated McKnight and Bay district from the Pearl and Hill districts, it was only later during the 1910s and 1920s that movies successfully expanded into areas characterized by Douglass as having ‘above average social quality.’ For a detailed analysis of moviegoing patterns in Springfield as these were embedded in systems of social stratification and cultural distinction, see Class Markers in the Mass Movie Audience. This visualization represents emerging constellations within an expanding universe of cinema. In 1910 this universe was on the verge of producing its first superstars, with luminaries such as Florence Lawrence, Mary Pickford, Charlie Chaplin, Pearl White and Helen Holmes becoming increasingly visible both on and off screen. The maps above depict Los Angeles, Denver, Kansas City, Boston, Atlanta and Dallas using data derived from The Billboard magazine’s inventory of motion picture theaters(1910). The maps offer a ‘comparative statics’ view of six key regional hubs that shows cinema’s uneven development as it transitioned from the dispersed and localized nickelodeon era into a national institution with a newly imagined movie community dominated by Hollywood (you can also explore the Billboard dataset for the entire U.S. using interactive maps). The spread of that institution was greatly aided by the railroads, which expanded the space of film distribution, and became an important element in the narrative space of many films. For a case study of this era, including a detailed analysis of the transition from the Motion Picture Patents Company’s short film programs to the serial and feature length narrative film formats, see Space, Place and the Female Film Exhibitor: The Transformation of Cinema.